International Journal of Research in Health Sciences,2014,2,4,1050-1056. 1-Assistant professor, Dept of Anaesthesiology, M.S.Ramaiah Medical College Research Institute, Bengaluru- 560054, Karnataka, INDIA. 2-Professor, Dept of Anaesthesiology, BMCRI, Bengaluru, Karnataka, INDIA. 3-Professor and Head of Department, Dept Of Anaesthesiology, BMCRI, Bengaluru, Karnataka, INDIA. 4-Assistant Professor, Dept of Community Medicine, PESIMSR, Kuppam, Karnataka, INDIA. Background: Postoperative sore throat, cough, and hoarseness of voice can contribute to post operative morbidity and patient dissatisfaction. Besides pain and nausea these are the most frequent subjective complaints. Objective: To determine and compare the effects of Ketamine gargle, Aspirin gargle and 10% Lignocaine spray on reducing the incidence and severity of post operative sore throat, cough and hoarseness. Materials and methods: Patients were randomly allocated in to three groups of 50 patients each. In group K (40mg Ketamine diluted in 29 ml of normal saline), group A (350mg of soluble Aspirin diluted in 30 ml of distilled water) and in group L (3 puff of 10% Lignocaine was sprayed before intubation). Results: The incidence of sore throat at 2nd hour was 20%(K), 24%(A) and 22%(L); cough was 20%(K), 12%(A) and 20%(L). All the patients were free of hoarseness in first 2 hours. 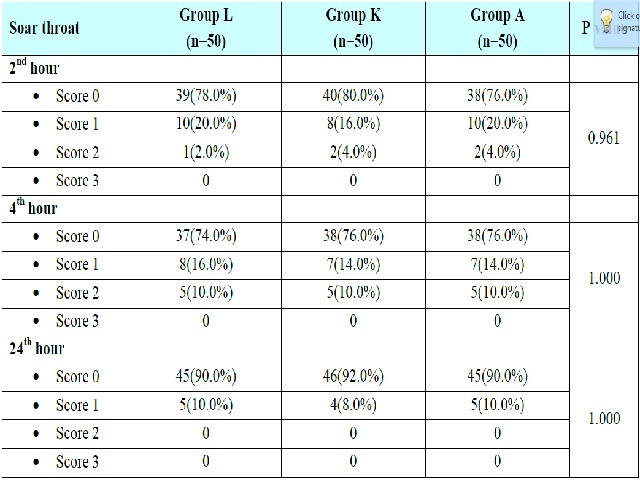 At 4th hour the incidence of sore throat was 24%(K), 24%(A) and 26%(L); cough was 16%(K), 18%(A) and 20%(L) and in group K and A only 4% patients had hoarseness of grade 2 severity whereas in L group 6% patients had hoarseness of grade 3 severity. At 24th hour the incidence and severity was decreased to 8%(K), 10%(A) and 10%(L) for sore throat; 4%(K), 6%(A) and 4%(L) for cough and all the patients were free of hoarseness at 24th hour. Conclusions: All the three drugs were equally effective in reducing the incidence and severity of post operative sore throat, cough and hoarseness without causing drug related side effects.